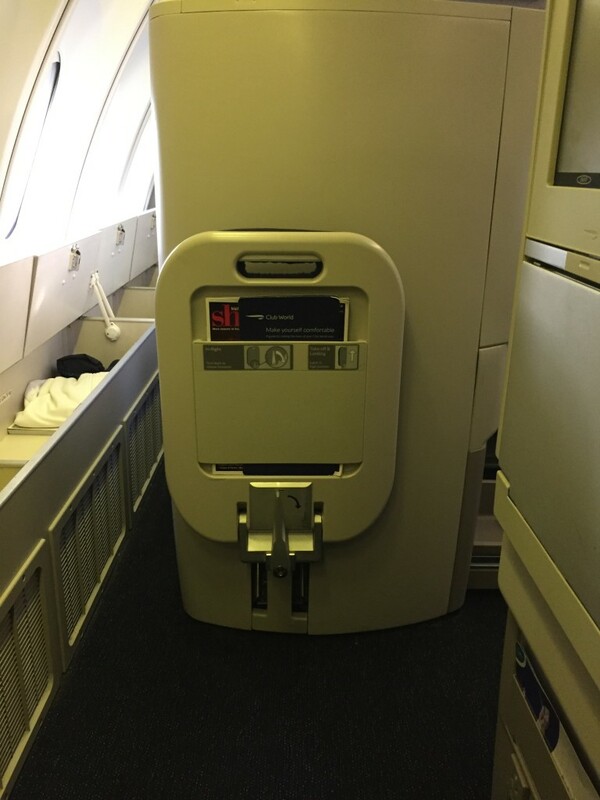 Between the negative reviews of British Airways’ Business Class product on Flyertalk and the fact that they made me pay to select seats in advance, I didn’t have high expectations for my flights to Zurich. The final verdict after my round-trip? I really, really liked my flights, and it was all because of the seat, which was so comfortable that I was able to sleep like a baby for 7-8 hours each way. That simply does not happen for a light-sleeping insomniac like myself. But let’s start form the beginning. there are twice daily flights between SFO-LHR, serviced by both a Boeing 747 and and Airbus A380. I decided to try each, and the outbound flight would be on the 747. In this instance I was happy to fork over the money for advanced seat assignments so that I could secure a seat in the upper deck’s cabin. One of the main benefits of the upper deck is the privacy, since there were just 20 total seats up there. The seat is pretty standard, but in my opinion there is one major drawback to the design. The forward/rear seat pairing means that you are literally face-to-face with your neighbor whenever the privacy screen is down. This was a non-issue for me since I was traveling with my wife, but I’d probably have felt differently if it was a stranger. None of the controls at the seats really worked that well – I’d push a button and nothing would really happen. In the end I basically had to just use my fingers to peel the tray table away from the holder. 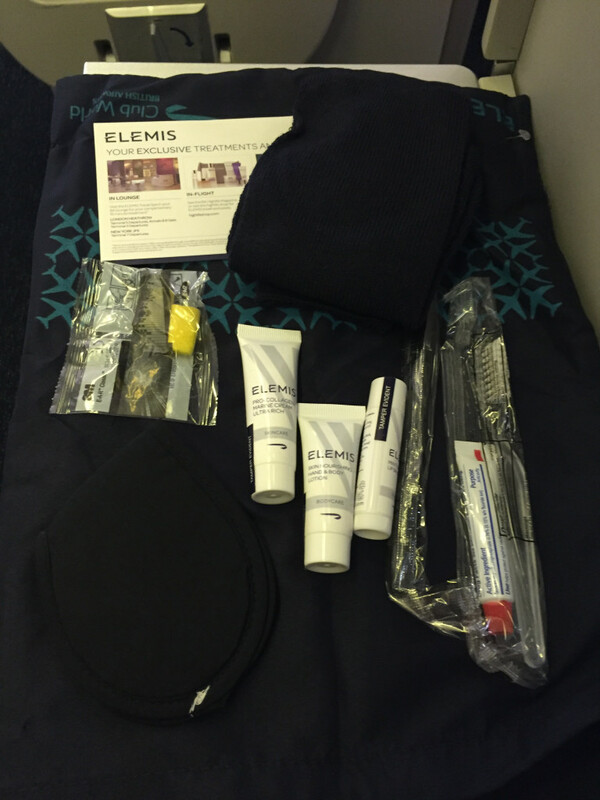 As everyone was getting settled in, the flight attendants distributed amenity kits which were actually quite well stocked. I had the same situation with the IFE screen getting stuck in the holder, and just ended up prying it out each time it was needed. The screen itself had mediocre resolution and a clunky touch screen system. The front/rear setup means that if you select a window seat, you’ll need to jump over the legs of the person diagonal to you each time you want to get out. I didn’t really find this to be that big of a hassle, and could easily step over that persons legs when they were reclined. There are a couple window seats with direct aisle access, but are usually the first ones to get reserved. On the flip side, if you want guaranteed aisle access you will want to book an aisle seat, but the trade-off is that these offer absolutely no privacy. After an on-time take off, meal service began with a perfect view of the California sunset. While I had pre-ordered my entree on the way home, I wasn’t able to do so on this flight but was given the full range of choices. Time to eat – some mixed nuts to kick things off. Up next, the smoked trout and mixed salad. Next up, the sea bream with coriander rice which was actually quite good. Fish was an easy choice over beef, since the latter is most likely to come out overcooked and tasting like shoe leather. Then then mango chocolate slice to finish things off. Overall, I’d rate the food on the flight as a solid B, nothing was completely inedible but there certainly wasn’t anything to get excited about. On the other hand, I’d rate the service a few notches lower. During dinner, the flight attendants were akin to bulls in a china shop, slamming down trays and loudly pulling down the center privacy dividers each time they made a round through the cabin. One more peek out the window, then it was time to snooze. I woke up about 45 minutes prior to landing and was able to sneak in a quick breakfast. The warm bacon roll was delicious, I easily could have eaten an entire tray of those. One final aerial view of London on our on-time descent into Heathrow. Overall I’d rate my Business Class flight on British Airways as an A-, and it all came down to the seat. After an uninterrupted 7+ hours of sleep I arrived extremely well-rested, and I credit that to the design of the flat-bed seat and the privacy of essentially having your own cave when next to the window. I actually wondered if it was simply a fluke that I had slept so well, perhaps I was just extra tired? But it happened on both the outbound and return flights, so I’m willing to call that enough evidence to attribute that to the comfort of the seat. After transferring and clearing the always thorough security checkpoint at Heathrow, we made our way to the British Airways Galleries Lounge. On the way into the lounge I was still waking up and had to do a double-take at the interesting artwork at the entrance. And then onward for an uneventful hop over our final destination, Zurich, where we landed in what appeared to be a beautiful winter wonderland. Facing my wife for 10 hours would be a major draw back. Each their own. Hi – Little details like the cost of prebooking seats would be helpful. thanks. It’s optional, not really necessary, and free when online check-in opens 24hrs before departure.